Tampa Bay Music Academy is excited to announce that we are moving to a new location! Our years on Tarpon Springs Road have been wonderful and have brought many students into our TBMA family. We will miss Odessa, but we are not moving far! Our new home will be located at 4941 Van Dyke Road, Lutz, FL 33558. We believe that our new home will position us well to serve our current student body and to expand to many new students also. 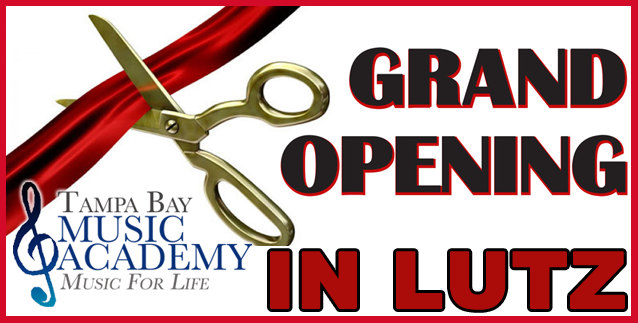 We will open our new location for all lessons and classes on Monday, January 4, 2015. We are currently enrolling for private music lessons at our new facility. Please contact us today to sign up or ask questions about piano lessons, violin lessons, cello lessons, drum lessons, saxophone lessons, guitar lessons, voice lessons, flute lessons, and more! Our experienced degreed teachers represent the best music faculty in Tampa Bay! We would love for you to join our Tampa Bay Music Academy family! Hello! My name is Kelly Sullivan. My 11 year old daughter has expressed interest in learning an instrument. My friend Kim Sinclair who has her two girls enrolled in your school highly recommended you. I would like some information on how I can get my daughter in for a trial lesson. Katie has no experience with an instrument but would love to learn the guitar or piano. If you could contact me with some information I would really appreciate it. Thank you! I look forward to talking with you. Hello, my 8th year-old son would like to play the violin. I would like some information on how to get him a trial lesson. He has never played any instrument. Damaris, that sounds great! We are going to send some information to your email address. We look forward to meeting you soon!